Gezien de huidige gebeurtenissen op onze planeet, bosbranden, orkaangeweld (en alle ellende van dien zoals overstromingen) en temperaturen waaronder de mens niet meer kan functioneren, zal die hoge temperatuur ervoor zorgen dat er steeds meer ijs afsmelt, zowel van gletsjers als van de ijsmassa's op de poolkappen. Verder zal ook de permafrost steeds sneller ontdooien, waarbij enorme hoeveelheden methaangas vrijkomen, zo ongeveer het sterkste broeikasgas op aarde*, dit zal de temperatuur nog verder doen stijgen, waardoor er nog meer ijs zal wegsmelten enz. enz..... (de ijsmassa weerkaatst zonlicht, als die ijsmassa steeds verder wordt verkleind, wordt er steeds meer warmte opgenomen door de oceanen, waardoor het nog warmer wordt enz. 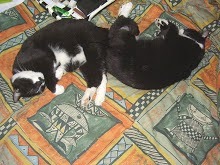 enz...). One NOAA oceanographer warns that even if humanity "stopped the greenhouse gases at their current concentrations today, the atmosphere would still continue to warm for next couple decades to maybe a century." As temperatures bust heat records across the globe and wildfires rage from California to the Arctic, a new report produced annually by more than 500 scientists worldwide found that last year, the carbon dioxide concentrations in the Earth's atmosphere reached the highest levels "in the modern atmospheric measurement record and in ice core records dating back as far as 800,000 years." 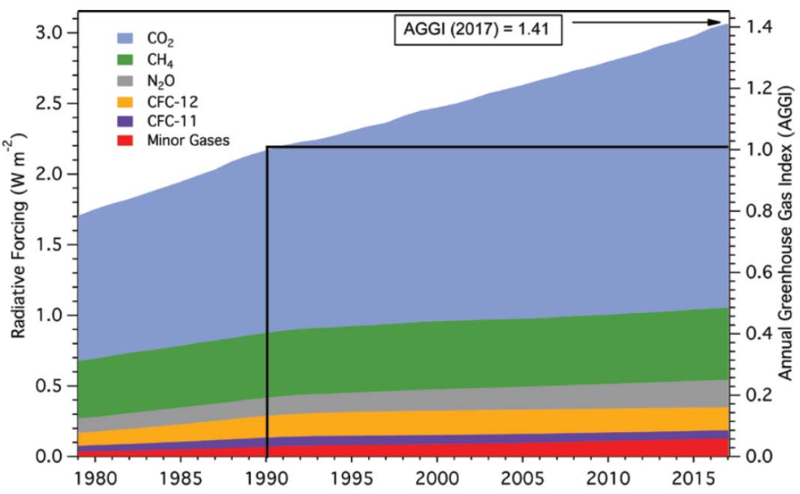 While the most significant jump was the global average for carbon dioxide (CO2)—which, at 405.0 parts per million (ppm), saw a 2.2 ppm increase from the previous year—concentrations of other dominant planet-warming greenhouse gases, methane (CH4) and nitrous oxide (N2O), also hit "record highs," according to State of the Climate in 2017(pdf) released Wednesday. Considering those rates, Greg Johnson, an oceanographer at the National Oceanic and Atmospheric Administration (NOAA) Pacific Marine Environmental Laboratory in Seattle, warned that even if humanity "stopped the greenhouse gases at their current concentrations today, the atmosphere would still continue to warm for next couple decades to maybe a century." The 332-page report—which was overseen by NOAA and published as a special supplement to the Bulletin of the American Meteorological Society—also notes that 2017 is among the three hottest years ever, taking the top spot for warmest non-El Niño year since scientists began measuring in the 1800s. However, NOAA data released last weekend shows that 2018 is on track to set a new record. The report details how "much-warmer-than-average conditions" across much of the world's lands and oceans has meant three years of "unprecedented" coral bleaching, Arctic air temperatures that are "warming at a pace that was twice the rate of the rest of the world," rapidly melting glaciers and ice sheets, and devastating tropical storms—such as Hurricanes Irma and Maria—that reflect "the very active state of the Atlantic basin." 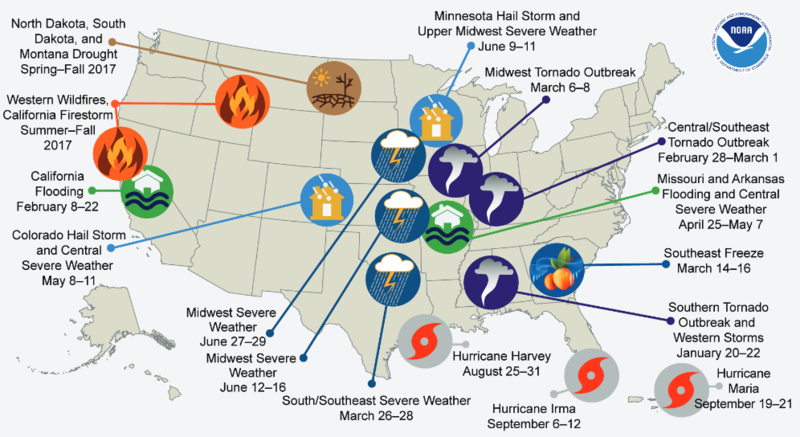 In its regional analyses, the report notes that "the United States was impacted by 16 weather and climate events that each caused over $1 billion (U.S. dollars) in damages. Since records began in 1980, 2017 is tied with 2011 for the greatest number of billion-dollar disasters. Included in this total are the western U.S. wildfire season and Hurricanes Harvey, Maria, and Irma. Tornado activity in the United States in 2017 was above average for the first time since 2011, with 1,400 confirmed tornadoes." 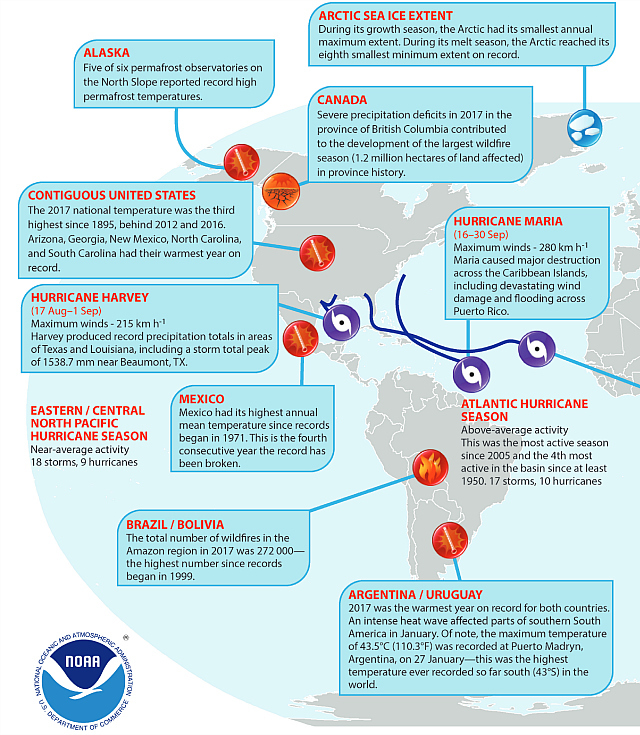 It also features a map that highlights notable climate anomalies and events across the globe during 2017. 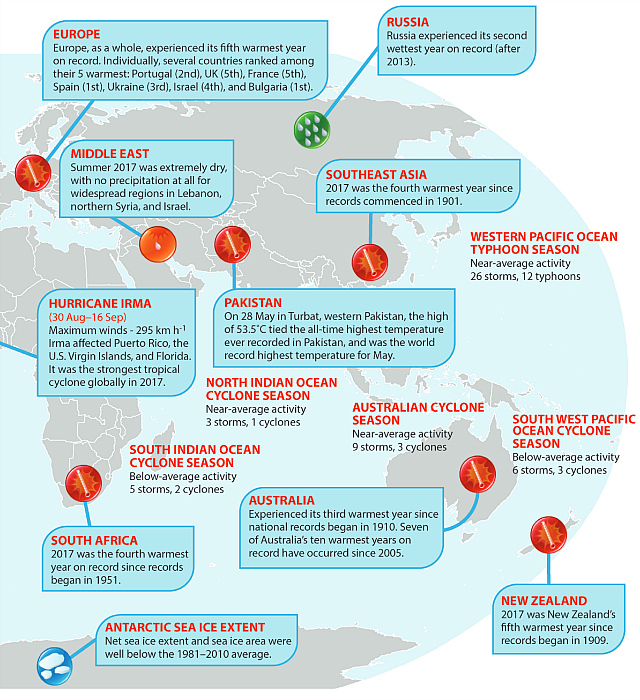 The graphic points out that both Argentina and Uruguay experienced their warmest years on record while Russia experienced its second wettest, and five of six observatories in Alaska documented record high permafrost temperatures. Permafrost is a layer of soil, rock, or sediment that remains frozen and contains massive amounts of carbon dioxide and methane. Climate scientists are growing increasingly concerned that "as the global thermostat rises, permafrost, rather than storing carbon, could become a significant source of planet-heating emissions." Voor meer berichten over de klimaatverandering, klik o.a. op de labels: 'klimaatverandering, klimaattop, methaangas, CO2, luchtvervuiling (vergeet niet dat de luchtvervuiling wereldwijd jaarlijks al een enorm aantal mensenlevens eist) en poolcirkel', direct onder dit bericht.